When fifteen-year-old Lance Covington finds an abandoned baby in the backseat of a car, he knows she’s the newborn daughter of a meth addict he’s been trying to help. But when police arrest him for kidnapping, Lance is thrust into a criminal world of baby trafficking and drug abuse. His mother, Barbara, looks for help from Kent Harlan—the man whom she secretly, reluctantly loves and who once helped rescue her daughter from a mess of her own. Kent flies to her aid and begins the impossible work of getting Lance out of trouble, protecting a baby who has no home, and finding help for a teenage mother hiding behind her lies. Terri has been my favorite author for some time. She is a great inspiration to me as I want to write in the mystery/suspense category like her. 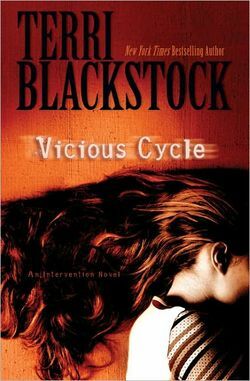 With her latest release, Vicious Cycle, she gives me more reason to keep her on the top of my list. Vicious Cycle takes place a year or so after the first book in the series, Intervention. Of course, there are returning characters such as Barbara, Lance and Emily Covington and Kent Harlan. If a person who hasn’t read Intervention, these characters may seem a little less 3-D, so to speak, than they would like. But that is why it is a series. We are, however, introduced to a knew protagonist named Jordan. Terri puts everything that is needed into Jordan to make her feel real. The plot was definitely intriguing and the end had me almost falling out of my bed, wanting to know what happens. As usual, Terri deals with present-day issues in this book. The issues dealt with in Vicious Cycle are crystal meth addiction and baby trafficking. I believe that these things need to be talked about and realized more in our world and I am glad that Terri does it in this book. All in all, I recommend this book very highly! If you love great suspense and characters, read this book and all other books by Terri! I received this book for free from Zondervan in exchange for an honest review. All thoughts and opinions are mine.